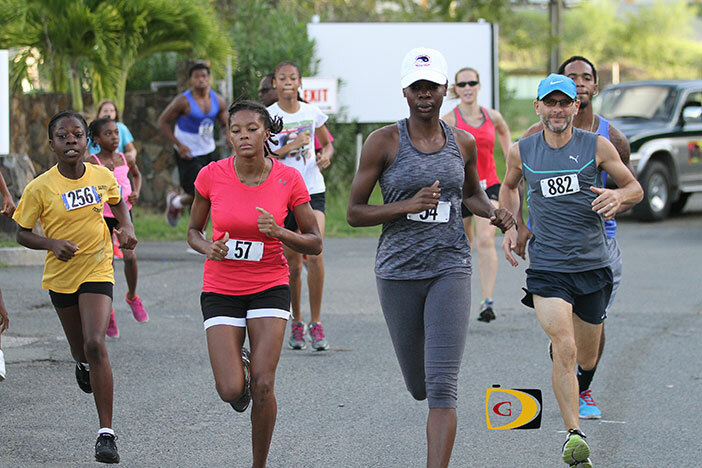 Tarika “Tinker Bell” Moses, 2nd left, winner of race #2 runs with race #1 winner Samantha John with eventual winner Katrina Crumpler in the foreground. Penn was referring to the fact that each of the first three races had been won by a different women, with Tarika “Tinker Bell” Moses who won race two finishing third in 13 minutes and 33.20 seconds; race one winner Samantha John placing second in 13:23.23 with Crumpler getting her first win of the series on Saturday in 13:05.56. Regarding the finale Crumpler agreed it’s going to be a showdown and its nice to have competition. Tarique Moses put himself in the drivers seat with another victory over defending champ Khiry Creque after running 11:27.56 to win. He said he was surprised because he was feeling sick. Leading the series 2-1 over Creque with one race to go, Moses said he’s a competitor he always wanted to take down and would be happy to win the overall title on Nov 15. The territory’s Premier Dr. Orlando Smith was among participants. He had been dropping his wife Lorna off to races to compete on the Rotary Club of Tortola’s team but his grandson gave him an invitation. “This is quite a good experience being out in the early morning and getting a run, it was good,” he said. “I’m quite pleased to see so many people participating. What it tells me is there’s a lot of people in the community who are conscious about their health and the need for exercise and I think more people should become engaged. Final Results: One Mile (Under 9); Boys: 1. Sammy Potgieter, 7:23. 2. Jahnare Farrington, 7:55. 3. Latriel William, 8:06. 4. Ajani Robinson, 8:16. 5. Sebbie Morgan, 10:11. 6. Jahheal Frett, 10:58. 7. Charlie Potgieter, 11.00. 8. Josiah Means, 11:09. 9. Leo Child, 11:31. 10. Seun Frett, 13:00. 11. Xavier Morgan, 13:04. 12. Kabrina Hull, 13:48. 13. Frank Carrol, 15:38. 14. Apollo Henry, 16:12. Girls: 1. Asia McMaster, 8:49. 2. Ashley Brockbank, 9:19. 3. Tamri Thomas, 9:43. 4. Kenniqua Grate, 9:56. 5. Taryn Augustine, 11:10. 6. Z’Hara McLean, 12.03. 7. Amariss Mclauren, 12:16. 8. Amia Wheatley, 12:17. 9.M’Kenzii Crabbe, 15:01. 10. Felisity Means, 16:35. Two Mile, Men: 1. Tarique Moses, 11 minutes, 27:56 seconds. 2. Khiry Creque, 11:42.23. 3. Vaughan Van Rheede Van Oudtshorn, 12:24.23. Julius Farley, 12:34.91. 5. Ravindra Sukhu, 12:38.84. 6. Khoy Vanterpool, 12:53.38. 7. Simon Cook, 12:59.56. 8. Adrian Dale, 13:39.34. 9. Chase Thomas (UVI), 13:49.66.13. 10. Trevonte Larose (UVI) 13:52.13. 11. Zebalon McLean, 13:54.06. 12. Shane Donovan, 14:28.03. 13. Gareth Watkins, 14:37.91. 14. Osiah Vanterpool, 15:15.70. 15. Luka Chalwell, 15:26.56. 16. Claudius Rymer, 16:04.84. 17. Jaden Augustine, 16:29.91. 18. Diamante Gumbs, 16:30.70. 19.Steve Augustine, 16;49.13. 20. Stepphen Gilbert, 16:50.13. 21. Malique Wattley, 17:15.63. 22. Andre Kartick, 17:25.56. 23. Orville McMaster, 17:27.95. 24. Dameon Creque, 17:29.63. 25. Gerald Bellot, 17:30.48. 26. Rashead Taylor, 27. Chad Willock, 17:46.34. 28. Simon Crook, 18:32.63. 29. Howard Moore, 18:37.38. 30. Elvette Dore Sr., 18:38.91. 31. Djimon Gumbs, 19:23.20. 32. Kenroy Joseph, 19:54.78. 33. Stephen Beard, 19:59.63. 34. Olonzo Boynes, 20:03.45. 35. Jim Cullimore, 20:37.31. 36. John Cullimore, 20:54.41. 37. William Kinkead, 22:48.20. 38. Lindell Defreitas, 22:55.95. 39. Kerry Chalwell, 24:29.20. 40. Devanio Wheatley, 24:57.13. 41. J’Khori Smith, 29:01.59. 42. Aiden Creque, 33:53.03. Women: 1. Katrina Crumpler, 13:05.56. 2. Samantha John, 13:23.23. 3. Tarika Moses, 13:33.20. 4. Kay Reddy, 14:28.03. 5. Beyonce Defreitas, 15:10.98. 6. Akada Charles, 15:71.13. 7. Arianna Hadye, 15:51.09. 8. L’T’sha Fahie, 16:06.03. 9. Akeela McMaster, 16:12.63. 10. Natasha Ruscheinski, 16:28.63. 11. Sh’kaida Lavacia, 16:50.13. 12. Anique Daniel, 16:51.63. 13. Zakharia Frett, 16:52.73. 14. Philomena Robertson, 17:55.20. 15. Tyann Smith, 18:10.31. 16. Xiomara Malone, 18.10.31. 17. Laura Dore, 18:10.56. 18. Jenny Dobbie, 18:53.41. 19. Claire Burke, 19:12.88. 20. Ghislaine Hoogendijk, 19:19.80. 21. Roslyn Gilbert, 19:28.88. 22. Magdalene Barzey, 19:33.31. 23. Shanique Erikson, 20:15.13. 32. Xaria Penn, 20:26.47. 33. Tamika George, 20:40.45. 34. Tiffany George, 20:49.84. 35. Lynelle Gumbs, 21:01.31. 36. Mariah Stoutt, 21:36.98. 37. Shirley Liburd, 22:52.13. 38. Sally Maloney, 23:44.31. 39. Valarie Guishard, 26:46.38. 40. Denise Glasgow-Frett, 29:55.31. 41. Ella Christopher, 32:01.38. 42. Maude Frett, 34:40.45.